Horizon BSF has used its expertise to develop and manufacture an innovative new design of roller board, winning a large contract to supply 280 units to schools across the UK. The Governments Building Schools for the Future programme has seen many schools being modernised, expanded or even re-built, using the latest technology and materials for the fixtures and fittings. However, the roller boards found in the majority of classrooms are still the out-of-date, less durable models manufactured from chipboard or similar material. 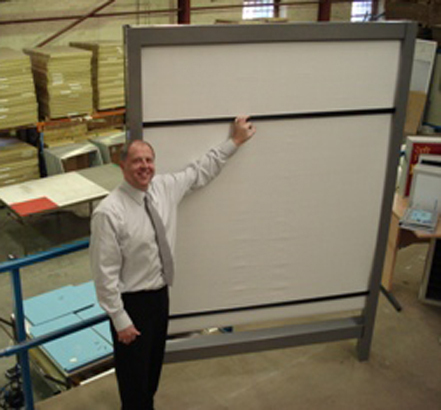 Horizon BSF was approached to design and build a new solution to take roller boards into the future. Using its knowledge and skills in sign manufacturing and fabrication, Horizon BSF built an aluminium version, which is lightweight and simple to fit, and as they are all built in-house, they can be made to suit specific size requirements. An added advantage to Horizon's roller board is the fact that they can be retro fitted. The existing roller material and roll bars can be removed from the old wooden models and inserted into the modern aluminium equivalent, meaning a cost saving for the school. As Horizon now has its own powder coating works, the company can paint the units to the specific colour requirements of the school, rather than wood being the only option. In a time where cutting costs, but having the latest tools with which to teach, are both of high importance in education, Horizons solution ticks all the boxes.